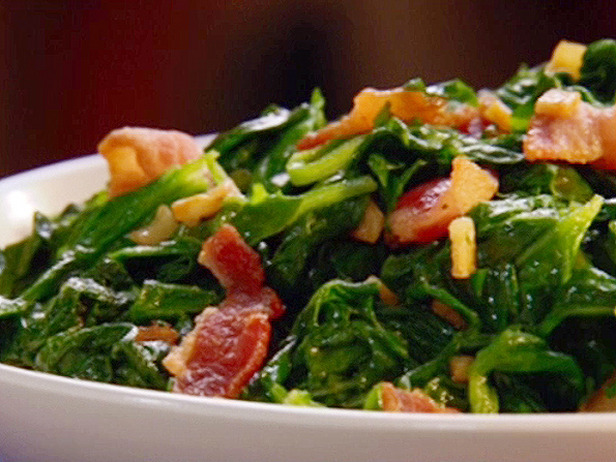 A Spinach Your Kids Will Eat! Kids won’t eat their vegetables? Mine wouldn’t. Not my 26-year-old, not my 10-going-on-30-year-old, not my nine, either. What to do? The answer came to me in the form of a challenge. When I was working as a line chef in the market in South Beach, the boss came in one day and challenged each one of us to come up with a totally new dish, unlike anything we’d been serving. One chef came up with completely new take on mac and cheese, another produced a remarkable hot-sour soup, and a third produced a recipe for Polynesian chicken that is still one of the faves in the market today, 35 years later (I’ll put that one up another time. I served it at my church when we made a welcoming dinner for the new ministers). What I produced was a sautéed spinach dish that had tons of garlic, a red-sauce reduction, prosciutto, fresh oregano, and Parmesan cheese, and the result was spectacular. I experimented at home, and kept working the recipe until my son, a devoted PB&J’er, not only ate a whole plateful, but asked for more, and requested that I put it in the regular rotation at home. A success! It’s easy to make, and uses ingredients you likely have at home already. Except the spinach and the prosciutto. I’ve kept working the recipe, because good prosciutto is expensive and cheap prosciutto isn’t worth the price it commands. I’ve made it with pancetta, hickory-smoked bacon, back bacon, Canadian bacon—even turkey bacon. I find that to me it tastes best with pancetta, but I have found that turkey bacon is actually a pretty good substitution. And since we don’t eat mammals around here anymore, turkey bacon is the condiment du jour Also, because really good Parmesan is more valuable than oil these days, I’ve come to accept and use the shredded Parmesan cheese sold in bags in the refrigerator section. The package says 100% Parmesan. Really? But if you really want to discover what the true gold tastes like, make it once with the true ingredients listed here—Parmesano Reggiano, pancetta or prosciutto, lightly chopped fresh oregano (you do grow your own herbs, don’t you? Why not? It’s too easy not to). 1. Buy your spinach from a farm market. Thank goodness for the Stoners at Central Market. Wash it at least twice. 2. Make sure the spinach is as dry as possible. I wrap it in lots of paper towels and keep it in the fridge for 2 hours. 3. Chop the spinach leaves to about three-inch square pieces. Set aside. 4. Heat a wok or large heavy saute’ pan, add just a pinch of olive oil and the chopped pancetta, saute until crisp. 5. Add the rest of the olive oil and the garlic, saute the garlic for 30 seconds, then add the herbs. Saute 30 seconds more. 6. Add the chopped tomatoes to the pan and stir-fry just until the tomato moisture is reduced away. 7. Add the spinach to the mixture and toss well to coat with the ingredients already in the pan. DON’T OVER COOK THE SPINACH HERE. ALL IT NEEDS TO DO IS WILT AND GET COATED WITH THE SAUCE. 8. Grind in some fresh black pepper, then add 1/4 cup Parmesan cheese and stir quickly to melt the cheese. Plate the spinach and sprinkle the remaining cheese over the top. Serve this immediately. And sit back and watch.